August marks fourteen years since Debbie and I first incorporated the company that is now Anna’s Gourmet Goodies. Like all businesses, we’ve had ups and downs, victories and defeat. Along the way, we’ve collected stories, relationships and experiences that will, hopefully, make it into the book someday. In the meantime, we strive to inspire you in some way, make you smile, or maybe even shed a tear. Whether you’re a customer or someone who takes time to read this post, thank you. It’s been over two years since I stopped sending out a ‘newsletter’, opting instead to share brief stories about experiences that are relevant (sometimes loosely) to Anna’s Gourmet Goodies. I’ve received more than a handful of comments and smiles from people who read the email, many of whom I had no idea were on the list. Our business has grown nicely these past two years, so I’ll continue for now. This month, I have two stories – one recent and one that while, not so recent, is an important part of understanding more about Anna’s Gourmet Goodies and what drives our business. 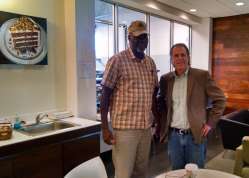 I met Michael Davis, a customer at Crossroads Infiniti (one of our customers) during a routine visit to drop off some cookies. After noticing his Army cap (retired), I shook his hand and thanked him for his service. We struck up a conversation and he shared a part of his story. He was in the Army Signal Corp. During one of his final deployments to Iraq, he had the opportunity to visit the hole where Saddam Hussein was captured and actually sat down with his feet dangling inside. As you might expect from his towering size, he did not go down inside. He was struck by the fact that someone who was at once so powerful, ended up tucked away in this tiny hole in the ground. I have no idea how many people in the world have done this, but meeting Michael and hearing about his experience made my day and gave me something to think about. A reminder that everyone has a story, and unless you take time to ask, you might miss out on a good one. When he left, I’m certain the service representative gave him a package of our cookies. A small gesture, but I hope that the cookies made by our hands served as another ‘thank-you and left him with a brief moment of happiness. One of my favorite stories is one that is difficult for me to tell without my voice cracking and my eyes starting to water. I’ve spoken about it many times to various groups, but it far easier to write. We sent Annalise gifts on a few occasions when her Aunt Tracey ordered cookies from us to send to her. She told us Annalise’s story, being diagnosed with Neuroblastoma while barely two years old. We sent her cookies once for her birthday, and included a mylar balloon and a stuffed animal (no, you won’t find this on our website). In 2012, Tracey sent us a note telling us that Annalise was going to be the featured child in a St. Baldrick’s event in her hometown and wondered if we might send some cookies. 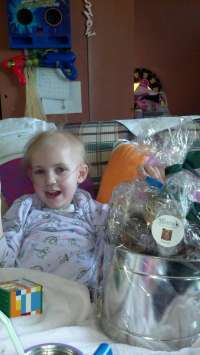 Having fought the cancer bravely for 5 of her brief 7 years, we eagerly agreed, put together a label with her name and picture and sent out a large tin bucket of cookies to help raise money, along with a special package for Annalise. The only thing I asked for in return, was a picture. I included a letter to Annalise, telling her how special we thought she was and how we would pray for her and ask God to give her time to do her work here on Earth. We never met, but I wanted her to know how special she was and that she inspired us with her spirit. We made sure the cookies arrived shortly before the event. While we were not there, we understand it was a big success. The picture we received was more than enough reward for us. On Sunday, March 18, the day after St. Patrick’s Day and a few days after receiving our cookies, Annalise lost her battle with cancer. I wanted so much to put some magic ingredient in those cookies to cure her disease, but alas I could not. What I can do, is to keep her memory alive by telling her story, just as I am doing right now. You can learn more about the upcoming 5k Run/Walk for Kids Cancer on September 30 here or read more about her on this website, AnnalisesFriends. It would be nice to think that of the hundreds of thousands of cookies and brownies we’ve sent out over the years have touched lives in a special way or inspired similar stories. Maybe. Maybe not. That’s okay. I share stories like these because I believe that in the case of people like Michael and Annalise, we all have the opportunity to make some small impact on the lives of customers, friends, family and strangers, even if for a brief moment. Share a story. Listen to a story. Pass on a story. It matters. It’s part of being human. Sharing stories is important to us because it helps our customers (and perhaps future ones) understand who we are and why we do what we do. We can’t say for sure, but with every package that leaves the bakery, it is our hope that the person who receives it will enjoy the work of our hands and at least for a brief moment, experience a memory that will become part of their life’s story, whatever that may be. A lofty goal, but it makes for a good ending to the story. If the Bradford pear trees in my neighborhood could speak and only say one word, it would be ‘Spring!’. Their white flowers are like trumpets, announcing the closing of the winter and the arrival of spring. Those of us on Daylight Savings Time have moved our clocks forward and the turning of the calendar from 2014 to 2015 is in the distant past. Did you make any resolutions for the year? If you are like most people, they’re long forgotten. I gave up on that practice a few years ago and adopted another method that is simple and actually sticks – a single word. 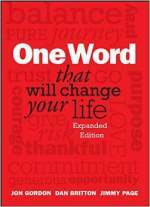 My friend Alan Hoffler of Millswyck Communications introduced me to the book, ‘One Word Will Change your Life’. I used it last year and decided once again to pick a single word to focus on for the entire year in both my business and personal life. This year’s word for me, is ‘Reach’. It’s both a noun and a verb. It’s a word that propels me to take action. It might be as simple as extending a hand to say hello to a stranger. Helping a neighbor. Picking up a piece of litter. Or stretching myself to learn and master something new. At Anna’s Gourmet Goodies, it is at the core of what we do every day. We reach out to people on behalf of others. We send them a gift of our cookies and brownies, sharing different messages depending on what the sender has to say. Sometimes it is a thank you, sometimes to extend sympathy, and sometimes just to say hello. I was delivering some cookies to Crossroads Infiniti, one of our local customers, several weeks back and had the opportunity to strike up a conversation with one of their customers in the waiting room. This Mom, with toddler in tow, was waiting for her car to be serviced. She shared the story of her husband, a Marine, and his deployment on an aircraft carrier. She did not have or share a lot of detail, but enough to know that he was in harm’s way in a part of the world more dangerous that I’ll probably ever know. He loved our cookies and enjoyed getting them any time he visited the dealership’s service department. I immediately saw this as an opportunity to extend our reach. I asked for his address and shared my intent with Paul the General Manager. He agreed that sending this Marine cookies was the right thing to do. I wrote him a letter, describing my conversation with his wife, included it with a fresh batch of cookies, and packed everything up for shipping. It just so happened this was the day of the biggest snowfall we had this winter. Nothing compared to what folks in the Northeast experienced, but enough to shut down our town for the day. But the cookies were made and we needed for them to reach their destination. 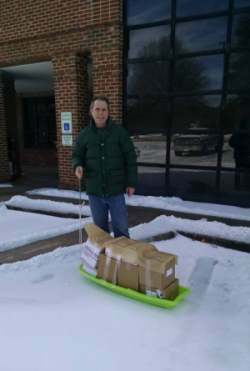 I piled the few orders we had on a sled and started the trek to the Post Office. It’s only about a mile or so from the bakery. While I might have been able to drive, it felt like the right way to send off these orders. I stopped along the way to strike up a conversation with a veteran wearing his Vietnam War hat and shoveling snow. I listened to some of his stories. He immediately understood my mission, and I went on my way. The Post Office gladly accepted our orders and sent them off to their respective destinations. About three weeks later, I received a wonderful email from the Marine, thanking me for the cookies. They had reached their destination, but more importantly, we were able to reach out and extend our thanks with a little taste of home to someone half way around the world serving our country. In the past weeks, we’ve had the opportunity to reach out to employees of a security company and wish them a Happy Anniversary, to clients of a financial planner to say Happy Birthday, and to residents of apartment communities to thank them for calling their community ‘Home’. I keep a copy of my word posted above my desk as a reminder to look for opportunities to practice, every day. It’s more than a ‘To-Do’ list or a long forgotten New Year’s resolution – it’s a reminder to reach out and focus on mental, physical, emotional and spiritual growth. If you’ve never picked a word and would like to give it a try, it’s not too late. Here’s a link to the book on Amazon. For Anna’s Gourmet Goodies, it’s about remembering that every single time we send something out the door, we are reaching out to someone, somewhere with a message and a gift that will hopefully bring them a brief moment of happiness. And that’s a goal worthy of a little extra reach. Any chef will tell you, it takes more than a list of ingredients to make something great. If you have ever had a pack of our cookies, you have a complete list of everything in them. But I’d like to think that after more than 13 years of baking, and 50+ years of ‘personal experience’ we’ve developed a unique recipe that makes every batch of our cookies and brownies something special. I’m often asked about my background and how it is that I came to bake cookies. Like most people, my life’s recipe is filled with events and experiences that, combined, brought me to where I am today. One of those experiences was meeting a man who became one of the most recognized faces on the planet based on his secret blend of 11 herbs and spices. Colonel Harlan Sanders. A quick stop in Corbin, KY to visit the birthplace of one of the most recognized brands on the planet. I tinkered with business ideas from a very early age. In high school, I discovered an organization called Junior Achievement and that forever impacted the course of my life. Junior Achievement was an after-school program which gave me the opportunity to setup and run a real company. 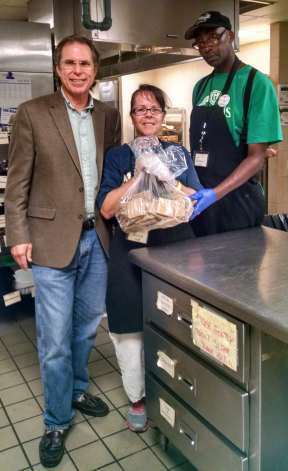 And to meet successful leaders and entrepreneurs like David Jones, the founder of Humana, Inc. I had the opportunity to meet Colonel Sanders on a couple of occasions, including a brief appearance in a television commercial promoting Junior Achievement. He arrived as you might expect in his chauffeur driven white Cadillac with red leather interior, wearing his white suite and string tie. He was cordial and greeted all of us. He delivered his lines, “Your friends are in Junior Achievement. You should be too.” and was driven away to his next appearance. Later that year, I was the Master of Ceremonies for our annual banquet. We honored the Colonel for his support. During the ceremony, he stood up and handed me a personal check made out to Junior Achievement for $50,000. It left an indelible mark on my high school career, meeting someone so well known who really cared about young people and giving back to his community. Colonel Sanders developed and perfected his recipe for fried chicken in a small motel/restaurant, Sanders Court, in Corbin, KY. Despite the success and notoriety of the food, Interstate 75 routed traffic away from his establishment. Customers dwindled and he was forced to sell the business. At age 65, he went back out on the road, selling his franchise concept of Kentucky Fried Chicken. He had a total of $105 in his pocket. At a time when most people are winding down their career, the Colonel was just getting started. There were many twists and turns along the road, but eventually he sold his business for $2 million, stayed on as their ambassador, and became one of the most recognized brand names in the world. 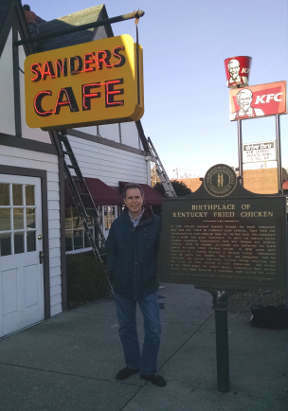 Last fall, we stopped in Corbin (as I have done in the past) to visit the original place where KFC was born. The restaurant includes areas where some of his original equipment is on display. It is a reminder and an inspiration of what can happen in business with enough persistence, patience and passion to be the best. While you should avoid saying ‘never’, it is unlikely that my face or the cookies from Anna’s Gourmet Goodies will ever achieve anything close to the level of notoriety of Colonel Harlan Sanders and Kentucky Fried Chicken. I’m comfortable with that. I do believe, however, that while there are countless places where you can purchase a cookie or a brownie made with most of the same ingredients we use (flour, butter, sugar, eggs, etc. ), none will be exactly the same as what we bake at Anna’s Gourmet Goodies. That’s because the ingredients of a business are more that simply what is listed on the label. It contains the experiences and passions of the founders as well as the people who help run the business. A small, but important ingredient in our business, came from my chance meeting with The Colonel. What comes out of our oven every day is more than simply raw materials, it is the sum total of a lifetime of experiences and a focus on what we consider the most important measure of success for our business and what we do – to create a simple moment that brings joy and happiness to the person who bites into a cookie or brownie that we’ve made. It’s not always been easy. Building a business takes time. But from what I learned early in life from people like the Colonel, hard work and doing the right thing is ultimately the best recipe for success. Every business has a story and history, some longer than others. The supplier for our primary ingredient at Anna’s Gourmet Goodies, organic whole wheat pastry flour, comes from a mill that was a business before America was a country. Founded in 1755 by Thomas Lindley, Lindley Mills operates at the same location and is run by a ninth generation descendant, Joe Lindley. It’s the only flour we’ve ever used for our cookies and brownies. And while I could get a distributor to deliver the product, I’ve made it a point to take time to get to know the folks at Lindley Mills and pick up our order at the mill. We usually stop in with a supply of our cookies made from their flour that are always well received. It might seem like a small thing, but I believe that having a personal connection to an ingredient produced by a descendant of the founder of a businesses started more than 254 years ago, adds more to our product than simply great flour. Anna and I hiked up the creek to the site of the Battle of Lindley’s Mill. The mill was the site of one of the largest and most hard fought engagements in North Carolina between the British Loyalists and the Whigs. 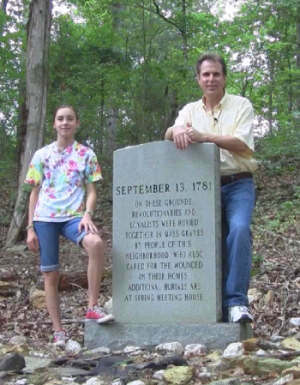 Anna and I toured the battle ground some years ago where the markers tell the story. On September 12, 1781, Loyalist leader David Fanning crept into the state capital, then in Hillsborough, secured the town and captured over 200 prisoners including Governor Thomas Burke. They moved the prisoners down to where the Wilmington road crossed Cane Creek at Lindley’s Mill. On the morning of September 13, the Whigs ambushed the Loyalists as they were crossing the branch, killing their commander, Colonel Hector McNeil. The Loyalists managed to secure the prisoners at the rear of the Spring Friends Meeting House and Fanning organized a flanking attack on the Whigs. The Whigs held their position for several hours, but were eventually driven back. Fanning, who was wounded, turned over command to Colonel McDugald who managed to reach Wilmington safely with the prisoners. In total, more than 250 men on both sides were killed or wounded. They were cared for or buried by the local Quaker community. While not a victory for the Whigs, the battle served as a turning point, inspiring them to double their efforts, fight on to suppress the Loyalists and ultimately, win the war. The mill was operated by the Lindley family for more than 100 years. After that, it changed hands and operated as a variety of grain related businesses. In 1975, two hundred and twenty years after opening, Thomas Lindley’s descendants re-purchased and restored the mill to operation. They’ve been grinding organically grown grain there on the same site, for the past 39 years. There are a lot of reasons why the cookies and brownies at Anna’s Gourmet Goodies taste so good. We developed the recipes and the process we use to make each small batch, by hand. Rather than simply tell you ‘we use the finest ingredients’ (a phrase you’ll find on just about every cookie or food site in the world) I thought you might like to know a little more about the history behind our ingredients. We just picked up a large load of flour to begin getting ready for the holiday baking season. I placed our order with June and Dewey helped pull the bags. Mr. Joe was busy that day (as he usually is), but I’m pretty sure he managed to get one of the cookies we delivered. They loaded us up, and I stopped on my way out to snap this picture of the mill, surrounded by the brilliant colors of fall. The history of Anna’s Gourmet Goodies is relatively short, going back a scant few years to 2001 when Debbie and I founded the company after I won Grand Champion at the Cheesecake Bake-off Competition for my Apple-Bourbon Cheesecake (yes – that’s another story). Lindley Mills not only provides us with a reliable source of a superior quality product, but adds an important ingredient to the soul of our business – a real sense of history and some perspective on time. I always look forward to taking a ride out in the country to visit our friends at Lindley Mills whenever we need a load of flour and a dose of perspective. We’ll carry it back to the bakery, mix it up with our other ingredients, and continue to turn out incredible cookies and brownies that are filled with passion, love and more than a little bit of history.